Barcelona is one of the few European cities to have such a strong tradition of food markets, with extensive municipal markets in all its neighbourhoods. Many of these began as farmers markets and evolved through the centuries. Those renovated by Modernist architects in the late 19th and early 20th century, such as the Barcelona Boqueria and Mercat de Sant Antoni are now considered some of Barcelona’s most remarkable buildings. 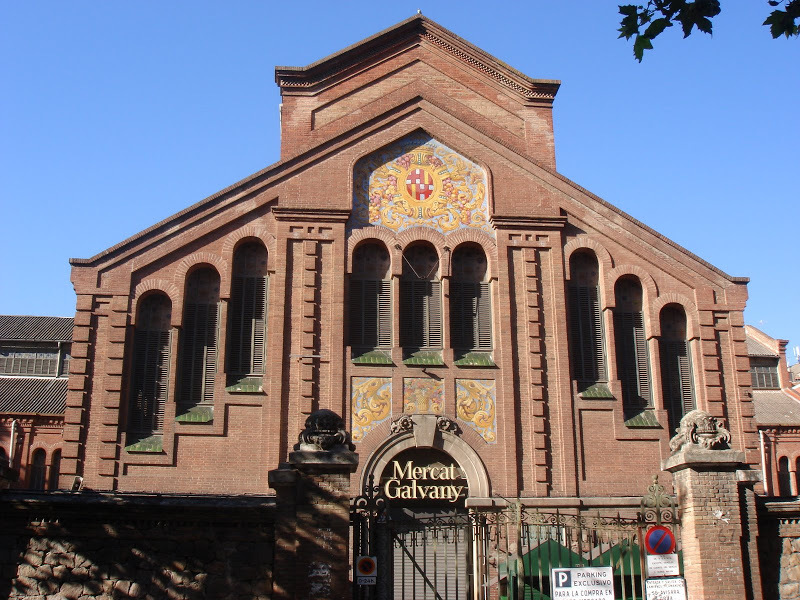 Often overlooked and well worth visiting, the Mercat Galvany is a real gem. It is located in the residential district of Sarria, on C/ Santaló 65 near Muntaner FGC, and immediately catches the eye of anyone who walks past. This is the city’s largest iron structure, tall, elegant and decorated with pretty coloured glass windows. It dates back to historic Barcelona, before the Eixample was created to join Ciutat Vella with the nearby villages of Sarria, Gracia, and Sant Andreu, and Sants. The surrounding area used to be covered with fields, country residences and farms. 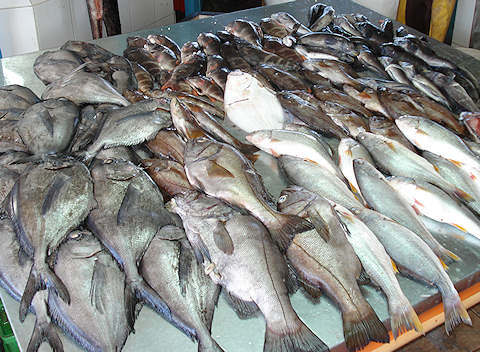 Farmers used to set up a weekly market; then a few butchers and fishermen started coming, and it grew steadily until in 1868 a permanent market was built. 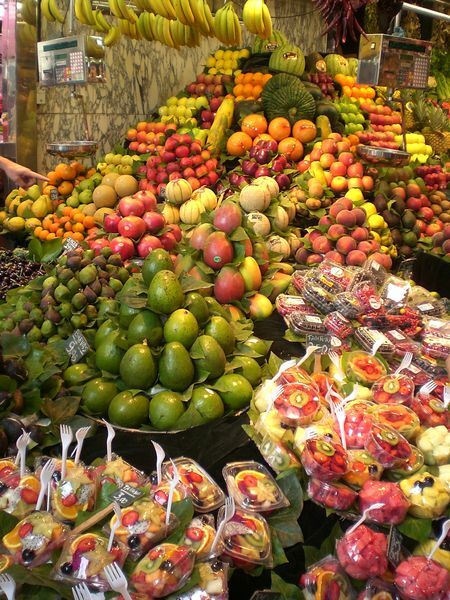 The Mercat Galvany in Barcelona is now a treasure trove of stalls with all kinds of fresh fruits and vegetables, and everything from cold cuts of meat to fresh fish, dried fruits and nuts, cereals, dairy products, and international specialties. It has a different ambience here to Barcelona’s city centre markets such as the Mercat de la Boqueria; its clientele are mostly local residents, whose families have been shopping here for generations. This well-to-do neighbourhood demands and can pay for the best, so you can be sure to find good quality here. Let us take you for a wander through the Modernist Mercat Galvany and introduce you to some of its unique characters and characteristics. Market trader Tristan Fidalgo works on a stall that was first established 70 years ago by his great grandfather. Freshly diced pumpkin cubes and artichoke hearts sit next to ready prepared traditional dishes, intricate salads, guacamole, and sun-dried tomatoes from Naples. According to Fidalgo, this Barcelona market has changed significantly in the last decade. 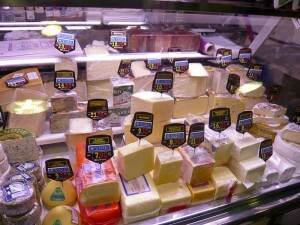 People previously used to buy one or two items in bulk from each stall, to get a better price. Now they tend to buy by the item. The market traders are unanimous in their opinion that although the supermarkets can always offer lower prices, market quality is much better. “I get small quantities from small suppliers, “explains Fidalgo. Specialisation and high quality are the trademarks of the Mercat Galvany. We pass a stall that only sells fresh farm eggs. “Why would you want to get your eggs from anywhere else? !” grins Josep. The next stall along specialises in German products, from cured meats and sausages to real apfelstrudel and countless other typical items. “Lots of German residents come here,” comments Encarna from behind her pile of goodies. Turning a corner we reach Charcuteria Carles, who invites us to a chupito of red wine, and a generous sample of Iberian ham and delicious cheese that melts in the mouth and reminds us how good these things really can be. This fresh food market is open daily from 9am-2pm. 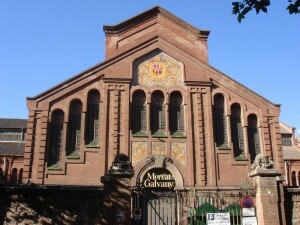 www.mercatgalvany.es. This entry was posted in Home, Restaurants & Food, Tourist Guide and tagged Apartment Barcelona, Barcelona culture, Barcelona market, Barcelona markets, food barcelona, food in barcelona, food market in Barcelona, food markets in Barcelona, Galvany Barcelona, local food Barcelona, markets Barcelona, markets in Barcelona, Mercado Galvany Barcelona, Mercat Galvany Barcelona, shopping in Barcelona. Bookmark the permalink.